Rugged dependable service at an economical price. 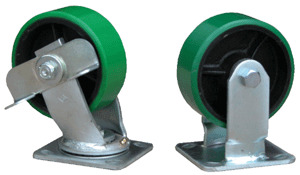 Extruded deck sections are engineered for high load capacity, durability and shock resistance. All aluminum construction. Includes one removable high-polished steel handle and two rigid and two swivel 5" x 2" poly-on-steel casters. Ideal for commercial, industrial and warehouse areas. Models V-SDD-2448 and V-SDD-3048 - Ships UPS!